Public Speaking Microphones: What are the Different Types? Public speakers often use microphones. What are the various public speaking microphones and podcasting microphones that you will come into contact with? Is there any use of microphone need to know information? Since podcasting may be in your public speaking future, is there anything to know about podcast microphones? Proper use of public speaking microphones is essential for the success of your presentation. The following information will provide understanding of the craft of public speaking. As a public speaker you will be called upon to use a microphone as your career advances. This is included in the speaker skills as it is a skill that needs to be learned. Like a pro ball player, actor, or any other high paid professional, mastering the microphone is essential to being on top of the public speaking game. Do not use this information to try to impress the sound staff. Don’t share this knowledge to make yourself look better. It can only get you in trouble. Rather, take this knowledge and put it to use as you grow in you skill. Take notes of the brand of mic you speak with, the kind of problems you noticed or problems your coaches may note. Then armed with this you can talk to the AV staff and make requests that will help you have your best sound given the microphones you will have to speak into. Some mic’s will have a tendency to pick up the popping P’s. Awareness of this can help you be mindful to master the use of the microphone. Another challenge in proper mic use is the pick up pattern. The mic you use can help or hinder your ability to communicate to the audience. Speaking to an audience in a wide seating arrangement creates the biggest challenge. As you look to the right and left, depending on the mic and if it is mounted, your voice could be picked up when facing the mic and not picked up as you look to the right and left. Finally, should you need to buy or rent a mic, this will help you have some background knowledge so that you can be an educated consumer. Take a look at the types of microphones, also called mics, and what they do. A condenser mic can range from a karaoke mic to high-fidelity recording mic. These are the usual choice of both laboratory and studio recordings. The application is varied from high-quality recording and lavaliere mics to built-in microphones in small sound recording devices and telephones. 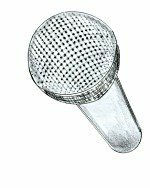 These mics are inexpensive, resistant to moisture and are most often used by singers. An omnidirectional mic picks up sound from all directions. Receive sound from both the front and back of the element. Sensitive to sounds from only one direction. The sensitivity is in the pattern of a heart shape. This is the most common speech or vocal mic used for sound systems where public speaking is preformed. There is one thing you can do that will set you apart from a hack and possibly keep you in the good graces of your sound professional. Never, ever blow into a mic to see if it works. I think people do this because they see others doing this. It can it directly damage the mic from the trauma of the human created micro cyclone entering the sensitive equipment. Secondary damage can come from spittle that comes out of your mouth. Both can ultimately damage the equipment. If your asked to do a mic check, start talking. Quote a famous line or speech. Ad lib a famous speech. Read an appropriate magazine page. Just say testing, one, two, three and so on. This allows the sound personnel to make adjustments to get the sound starting out at a reasonable level for an actual voice, which is what the mic is designed for. Regardless of what you see on TV, never throw, drop or swing the mic if corded. All of these can damage the mic. Never coil the coaxial microphone cable around your arm like a rope. It has a single copper wire inside and can be broken in time if not handled properly. If others do it and it is not yours, say nothing. But be aware that any problems in the system could be caused by a bad cable. Never point a microphone at a speaker. The resulting noise (feedback) is annoying and distracting. It speaks of inexperience. Some older mics if too close to each other can create another type of interference. If you note undesirable noises and your using two mics for two people, try separating the two a bit. If you hear a ringing sound coming and going as you speak, the problem may not be the mic. It may just be you. The sound man may be giving you a que to hold the mic closer to your mouth. He is turning up the sound as loud as he can and getting feedback. Then he backs it off a bit. The problem, he is having a hard time getting your voice to an adequate level for the audience. Putting the mic closer to your mouth will help. Depending on the mic, most fixed mics can work adequately up to a foot away from your mouth. You will have better control if it is closer. Often times the speakers who dislike the mic in their face will be found looking down to read their speech rather than deliver it as if their own words. If you have to read, pick up your notes and hold them to one side of the mic while not hiding your face from the audience. If you want to improve, start counting how many words a poor speaker actually says looking at the audience. Truly skilled speakers can give a manuscript as though it were their own. This is the high hurdle of public speaking. So learn to give your speech with out being tied to your notes and thus be able to use the microphone better. There is probably a book worth of information on the use of public speaking microphones. This is only covering the basics. Include proper use of microphones in your quest to become a better public speaker and you will be well on your way to speechmastery.